Troops from 51st Highland Division unloading stores from tank landing craft on the opening day of the Allied invasion of Sicily, 10 July 1943. Just after dawn, men of the Highland Division up to their waists in water unloading stores on a landing beach on the opening day of the invasion of Sicily. Meanwhile beach roads are being prepared for heavy and light traffic. Several landing craft tank can be seen just of the beach (including LCT 622). Parnall, C H (Lt), Royal Navy official photographer – http://media.iwm.org.uk/iwm/mediaLib//30/media-30134/large.jpg This is photograph A 17916 from the collections of the Imperial War Museums. The bloody and prolonged fight that entangled Allied and Axis troops from Sicily up to the Brenner pass (10 July 1943 – 2 May 1945) was not the logical outcome of a clear war strategy. Instead, it came as a compromise between conflicting views by the US and Great Britain, as well as a result of German uncertainties on their Mediterranean strategy. The US political and military leadership advocated a strategy based on the direct assault on the European heartland as the most effective way to assist the Soviet Union, destroy the German Army and deploy the full potential of the American military machine. The United Kingdom, instead, espoused a “peripheral strategy” of encirclement through the Mediterranean and the Balkans to defend British imperial interests in the Middle East, check Russian expansionism in Central Europe and minimize the battle attrition on Britain’s depleted manpower reserves. At the end of 1942, the Western Allies compromised by agreeing on the invasion of Sicily and Southern Italy as an intermediate objective to protect shipping routes in the Mediterranean, occupy the air bases in the Foggia plain and force Italy out of the war. German leadership was also divided on the strategy to be adopted in the Mediterranean – to defend Northern Italy’s industries and food sources by consolidating along the Pisa-Rimini line (more or less the future Gothic Line) along the natural barrier of the central Apennines, or force a prolonged struggle up the Italian “boot”. Hitler, who initially advocated the first course of action, changed his determination after the able leadership of Generalfeldmarshall Albert Kesselring attained a successful containment of the Salerno beachhead during the fall of 1943. The contrasts between the US and the British surfaced again during the following winter, while the opposing armies were stalemated on the bloody Cassino front and on the Anzio beachhead. When Rome was finally liberated on 4 June 1944, the British made a last attempt at winning Washington to the idea of a push through the Balkans. The US however held firm. A sizable portion of Allied military forces was shifted to Southern France to support the main offensive against Germany, and the Italian campaign became a war of attrition with the declared objective of diverting G erman resources away from the battlefields of Northwest Europe (and, incidentally, Russia). When the Allies launched their offensive to breach the Gothic Line at the end of August, 1944, they had lost their wide margin of superiority over their well-entrenched and determined foe. The British 8th and US 5th Armies succeeded in breaching the German main line of resistance along the Adriatic coast and in the Tuscan Apennines, but the coming of the worst winter in years and the severe shortages in materiel and manpower brought the drive to a standstill short of its strategic objective – the breakthrough into the Po Valley. Soldiers and civilians alike had again to face a bitter winter of blood and sufferings. The Allied launched their final offensive on 9 April 1945, bringing about in less than a month the liberation of Northern Italy with the help of the general insurrection guided by the Italian resistance movement. On May 2, 1945, the German forces in Italy surrendered unconditionally. The campaign had cost the Allies about 312000 casualties. The Germans had suffered 336000. As for the Italians, twenty months of war had caused 187000 dead (including 120000 civilians, of which 40000 caused by bombings) and 210000 missing, including more than 100000 civilians. The defense line prepared along the Apennines was named by the Germans “Gothic Line” (Gotenstellung). During the Summer of 1944, when it was feared the Allied armies would easily breach it and fan out in the Po Valley after their advance North of Rome, the name was changed to “Green Line” (Grune Linie), so as not to compromise such an imposing denomination, but the first name survived in general parlance. 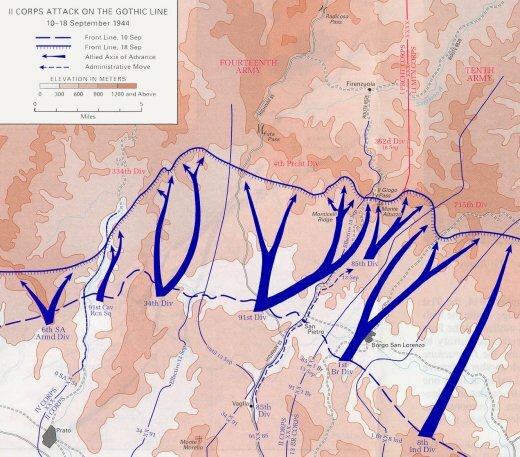 The tactics of retreating to organized lines of defense prepared along prominent terrain features up the Italian “boot” (such as the “Gustav Line” at Cassino) was successfully followed by the German Army throughout the Italian Campaign. The German command had started to study the idea of fortifying the Central Apennines already in August 1943, when the Allies were still fighting in Sicily. Work however started only during the Spring of 1944, under the direction of the Todt work organization. The Gothic Line was not a continuous line of fortification, but rather a series of strong-points arranged in depth, exploiting the natural terrain features which favored the defender. Traversing the Italian mainland from the Tyrrenian coast North of Viareggio to the Adriatic at Pesaro, the line extended for more than 300 km. It included thousands of field fortifications made of wood, rock or steel-girded concrete, and included long antitank ditches such as the one at Santa Lucia near the Futa Pass. Extended minefields and wire emplacements completed the picture. anchored on strong-points covered by extended wire and mine fields. Because of the enemy disposition, the US command decided to attempt a breakthrough at the less defended Giogo Pass, feinting a covering attack in force against the Futa Pass by the 34th and 91st Ids. Allied operations along the Thyrrenian coast (the sector of the IV Army Corps) took on a secondary role to those in the Central Apennines North of Florence till the final offensive in the Spring of 1945. “Moving up through Prato, Italy, men of the 370th Infantry Regiment, have yet to climb the mountain which lies ahead.” Bull, April 9, 1945. 111-SC-205289. NARA Archive. The picture NARA 111-SC-205289 is not correctly located, the right location is always Tuscany but near Massa – North of Pisa; the small group of houses is named Piazza and it was part of Montignoso Community. Montignoso was liberated the 8th April 1945 by the 442nd Infantry Regiment. Information about the localization was submitted by Mr. Francesco Matteucci. The order of attack against the Giogo pass envisaged a maneuver aimed at conquering the heights overlooking highway 6524 (nowadays SS 503) – the Monticelli hill mass to the West (91st ID sector) and Mount Altuzzo to the East (85th ID sector). Attacking units were supported by the entire Artillery complement of the II Corps. The attack was to be preceded by massive air strikes that would hit deep behind enemy lines and then shift to the front area. Such big numbers notwithstanding (the US 5th Army at the time fielded ten combat divisions with a force of 262000 men), the decisive battles on the front lines were fought by units totaling less than a thousand men: a few rifle companies belonging to a few Infantry battalions. On the German side, this disproportion was even more marked. The 4th Parachute division alone, well below its full complement of troops and equipment, held a 20-kilometer front from the Futa Pass to Mount Pratone, with no available reserves. Among its men, only a few scattered veterans of the Cassino battles survived. Most were inexperienced replacements sent directly from Germany. Many had never fired their rifles. been dug straight back into the mountain to a distance of seventy-five feet and were large enough to accommodate twenty men. On a hill 300 yards north of Monticelli a huge dugout had been blasted out of solid rock. Shaped like a U and equipped with cooking and sleeping quarters, it was large enough to accommodate 50 men. The Outpost Line of resistance covered the highway at l’Omomorto. On Mount Altuzzo, the German MLR developed along a trail at mid ridge covering the southern “bowl” of the mountain, anchored to the West on a crest which projected southward dominating the highway. To the East, the German defenses went up the ridge culminating at the top on hill 926, the highest point on Mount Altuzzo. The OPL covered approach routes along the western ridge and the main, eastern ridge line at hill 782. The stalemate broke during the late afternoon of 15 September, when front-line units succeeded in directing Artillery fire on top of the German positions. When company B, 363rd Infantry, reached the crest line on the Western ridge of Monticelli, however, only 70 soldiers were left of its original strength of 200. Isolated, out of supply and subjected to continuous heavy fire, for two days the Company repealed German counterattacks, till the advance of the 3rd battalion on the right wing of the attack reached hill 781 at the top of Monticelli – At 1448 word was received that the company commander of Company K, Captain William B. Fulton, his radio operator, and six enlisted men had reached the top of Monticelli, substantially ending the fight for the entire hill-mass. In the Company B sector alone, more than 150 German dead were found after the fight, and 40 prisoners had been taken, at the cost of 14 dead and 126 wounded GIs. Other companies fared even worse – a wasteful, useless frontal attack by one Company in the 3rd Battalion substantially annihilated the unit as a fighting force within a few minutes with no gains accomplished. The task to conquer Mount Altuzzo in the 85th ID sector fell on the 338th Regiment, 1st battalion in the attack. Difficulties in establishing the exact location of front-line units and faulty communications however soon disorganized the attack of the two point companies against the southern ridges of Mount Altuzzo (hill 782 and the Western ridge, soon renamed “Peabody peak” from the name of Company B’s CO). The action soon disorganized into a series of firefights between small groups of soldiers on both sides. Several attempts at counterattacks by the defender were halted by US Artillery concentrations, often hitting staging areas before German troops could organize for attack, depleting the already hard-pressed 1st battalion of the 12th Fallshirmjäger Regiment. On 15 September, the German command belatedly realized that the Giogo Pass attack constituted the main thrust by the US 5th Army. The 3rd battalion, 12th Fallshirmjäger Regiment was hastily brought forward, together with the scant reserves available to the whole Army Corps. These included 400 Lithuanian conscripts, most of whom surrendered to the GIs at the first opportunity. The 1st battalion, 338th Infantry finally reached the top of Mount Altuzzo on 16 September. The successful thrust on Mounts Pratone and Verruca on the right of the II Corps sector, the next day, substantially ended the fight. Acknowledging defeat, the Germans retreated to the next defensible ridgeline North of Firenzuola. American troops finally secured the Giogo Pass on 18 September. Six days of battle had cost the US II Corps 2731 casualties. German casualties are unknown, but surely higher, most of them caused by Artillery fire hitting approaching troops behind the lines. In 1944 US Infantry Divisions were organized along “triangular” lines, i.e. including three Infantry regiments with three battalions each. Divisional Artillery also included three battalions, with thirty-six 105-mm Howitzers and twelve 155-mm Howitzers. The three Infantry regiments, moreover, fielded eighteen 105-mm M3 Howitzers and fifty-seven 57-mm M1 antitank guns. Supporting and attached units included Ordnance, Quartermaster, Signal, Tank, and additional Artillery. Infantry battalions were organized with three rifle companies and a heavy weapons company with three 81-mm mortar platoons (for a total of six mortars), eight cal. .30 Browning M1917A1 heavy machine guns and seven 2.36” rocket launchers (Bazookas). Companies were identified alphabetically from A to M in battalion order. A, B and C (Able, Baker, Charlie) were the three rifle companies of the 1st battalion of each regiment, D (Dog) being its heavy weapons co. The same logic applied to the 2nd and 3rd battalions with companies E, F, G and H (Easy, Fox, George, How) and I, K, L and M (Item, King, Love, Mike) respectively. Rifle companies, with a force of 193 men, were organized on three rifle platoons and a weapons platoon. Each rifle platoon was further divided into three 12-men squads: 11 EM’s were armed with cal. .30 rifles (usually “Garand” M1 semiautomatic rifles, sometimes the older M1903 “Springfield” for sniper or grenade launcher use), the twelfth carrying the M1918A2 Browning Automatic Rifle (B.A.R.). The weapons platoon, with two Bazookas and two Jeeps, had three squads, each manning a 60-mm. M2 Mortar, and a MG section with two .30 caliber Browning M1919A4 light machine guns. Officers and some noncoms were issued .30 caliber M1 carbines. In combat, however, soldiers had a certain degree of freedom in choosing their weapons, and, depending on the tactical situation, many preferred to carry .45 caliber submachine guns or .30 caliber carb ines. Also, veteran units had the habit of unofficially “requisitioning” support weapons in excess of the prescribed number. During WWII, German parachute units were not part of the Army (Heer), but were instead organized, commanded and supplied by the Air Force (Luftwaffe). This often had adverse effects on logistics and the chain of command. Parachute divisions (Fallschirmjäger Divisionen) had a relatively flexible table of organization. Usually they comprised about 15000 men in three Infantry regiments, each organized on three battalions, an antitank company, and a heavy mortar company equipped with 120-mm GrW 42 (Granatwefer) mortars. Organic artillery included three battalions for a total of 24 FH18 (Feldhaubitze) howitzer, 12 150-mm sFH36 howitzer, sixty 75-mm Pak 40 (Panzerabwehrkanone) antitank guns and eighteen 88-mm Pak 43 guns. During the Italian campaign, moreover, German troops made widespread use of Italian equipment captured after the Armistice of 8 September 1943. German parachute battalions were formed on three rifle companies, a heavy mortar company with 80-mm sGrW 34 mortars, and a MG company armed with MG42 machine guns on heavy mounts. During the later stages of the War, however, German units were never able to deploy the full complements of personnel and weapons prescribed by tables of organization and equipment. The situation reports of the German 10th Army in Italy, for instance, indicate that at the date of 27 October 1944 the 4th Fallschirmjäger Division had only 3000 men, six AT guns, thirty-two 20-mm AA guns and thirteen 88-mm dual-purpose guns. In modern war, most casualties among combat troops are not inflicted by small arms fire (such as machine guns), but rather by artillery fire. During World War II, this accounted for about 80% of wounds inflicted in action. Superiority in the use of artillery was one of the key advantages of Allied armies over the Germans. The U.S. Army in particular surpassed all other belligerents both in quantity of guns and in the use of advanced fire control methods. Liaison with front-line units was usually established at the company level by attached teams of Artillery Forward Observers (FOs). The FO teams established radio communication with fire control centers that distributed fire missions to available batteries according to established priorities and location. Allied air superiority, moreover, made it possible to maintain air observation over and beyond the front lines, allowing for accurate and timely delivery of fire missions on targets of opportunity – a tactics originally developed by the German army in 1940. The exchange of information and orders among fighting units has always been extremely important on the battlefield. Difficulties in communications, the so called “fog of war” which seems to envelop everything in the heat of battle, preventing soldiers and commanders alike to understand what is going on, have sometimes altered the course of military campaigns. During WWII the widespread use of radio communication partly solved the problem, more so on the Allied side. However, adverse meteorological conditions, terrain, and technical or supply constrictions made often necessary to rely on more traditional and proven methods of communication. Wire systems, on the other hand, were vulnerable to road traffic and artillery fire and required continuous maintenance by signal troops. In the age of technology Armies need an enormous amount of supplies to fight effectively. Rations and medical items, obviously, and fuel, small-arms and artillery ammunition, replacement parts, etc. During WWII, on the average, each fighting man on the front lines was supported by eight to nine soldiers charged with supplying. This held true for both the Allies and the Germans. To gather an idea of the magnitude of the effort required, the port of Leghorn, liberated on 19 July 1944 and used thereafter as the main supply base for the US Fifth Army, had to be cleared by more than 25000 German demolition mines before it could be put back in use. The first Allied convoy was unloaded at its facilities already on 3 September, and at the end of the month more than 45-thousand tons of supplies were processed through the port each week. Fuel stocks in the Leghorn area reached the level of 20-million gallons. One-million gallons more were stocked in a camouflaged depot in a vineyard a few kilometers south of Florence, close to an olive grove hiding one-million food rations. Yet, supply shortages were a key factor in stopping the Allied offensive to breach the Apennines during the Autumn of 1944. A major obstacle to the operations of the Allied armies in Italy during the Winter of 1944 was the poor condition of the communication net to the front lines. Damages to the rail lines, both by German demolition and previous Allied bombings, limited their usefulness for long-distance communication. Apennines valleys, on the other hand, were almost always devoid of effective lateral communication by road. To move large units by a few miles on the map thus required long and dangerous detours. Extremely bad weather and round-the-clock traffic took a heavy toll on the Italian road net requiring continuous attention by engineer troops. To overcome in part these obstacles, the 5th Army built a new oil pipeline from scratch, connecting directly the port of Leghorn to the Raticosa Pass in the Tuscan Apennines. This was completed by the end of November 1944.